Pakistani restaurant in Thornton Heath. They also do takeaway and delivery, with online ordering via Just Eat. The single room seats around 40 people at tables covered with boldly blue and white striped vinyl tablecloths, flanked by clear plastic seats. Sparkly red tiles cover the floor. An elaborately-patterned feature wall at the back adds interest, along with filigreed metal lanterns hanging at the corners of the room. Flatscreens are mounted on the rear wall. Kake first visited on a Monday Bank Holiday morning in May 2017. I was one of just two customers when I arrived around 9am, but several others turned up while I was there, both for eat-in and for takeaway, and by 9:30am it was fairly lively. A talk show was playing on the flatscreens, with the sound loud enough to listen to, but not so loud as to impede conversation. The situation on my second visit on a Friday morning in February 2019 was similar. 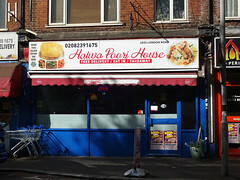 Both times I went for the eponymous halwa poori (£5) photo, which consisted of two deep-fried flatbreads along with chickpea curry, potato curry, and a portion of semolina-based halwa. The curries were served lukewarm rather than hot, but this worked well in context. The poori were freshly fried, and cooked through without losing their softness, but they were also quite oily. The chickpea curry was mildly spiced — savoury rather than hot — while the potatoes had a hint of chilli heat. The halwa was nicely soft and not too sweet. A cup of masala tea (£2) was milky and strong, though with fairly subtle spicing. It came unsweetened, with sugar on the side. Kake's verdict: The food isn't as refined as in Karachi Cuisine just up the road, but the atmosphere is more casual and relaxed here. On my second visit I sat with a cup of tea and worked on my laptop for an hour or so after breakfast, and didn't feel out of place. Child-friendliness: There's a pull-down nappy change in the ladies' (gents' not checked). Accessibility: A small step to get in. Another small step to the toilets. Last visited by Kake and friends, February 2019. Opening hours taken from menu, May 2017. Last edited 2019-03-24 11:46:17 (version 4; diff). List all versions. Page last edited 2019-03-24 11:46:17 (version 4).